End grained balsa core construction with hand laid‑up glass in both hull & deck. Vinylester resin in outer hull skin for 10 year transferable blister warranty. Heavy duty stainless chainplates bolted to main bulkhead. Anodized aluminum mast bearing beam, glassed to hull and grounded to keel. Low maintenance molded V‑berth unit bonded to the hull to form watertight compartment. Aft storage compartments port and starboard with access from below. White gel-coat hull and deck. Molded positive traction non‑skid surface on deck. Hull and deck joint bonded with Plexus structural adhesive. ORC sized white thermo‑plastic toe rail running full length of the deck both sides. Lead & Antimony fin keel finished in epoxy primer. 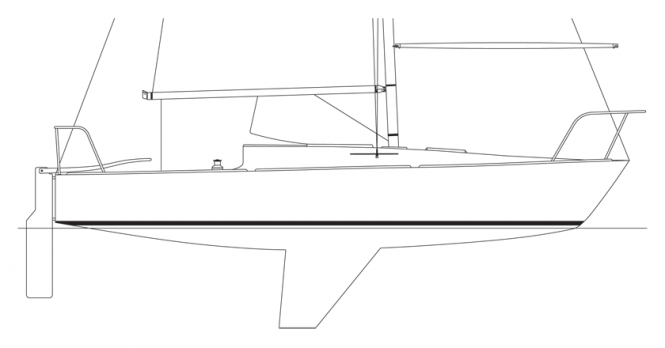 Near minimum weight faired transom-hung rudder. Heavy-duty SS rudder gudgeons and hardware. Custom laminated tiller with hiking stick. Tapered, anodized aluminum racing mast with airfoil spreaders, thru‑bar spreader bracket, Gibb "T" terminals, and black measurement bands. Three sets of holes at 1/2" intervals in mast bearing beam with two stainless fastpins for easy adjustment. Anodized aluminum boom with Harken 5:1 internal outhaul and adjustable reef line. Winch handle and plastic holder. (2) black anodized jib tracks, with adjustment holes and two jib block on cars. (2) black anodized genoa tracks, with adjustment holes and cars. Foredeck hatch mounted with lid opening forward. White main hatch with molded seahood which slides on white PVC runners. Seahood inspection port for lifting strap access to keel. Bow mooring eye and two bow chocks. Heavy duty stainless stemhead fitting with snap shackle for genoa tack. Two four bolt mooring cleats aft. Teak and holly synthetic cabin sole. Large forward V‑berth, with two access boards above mast step area and three inspection ports for access into v‑berth compartment. Molded sink with one flexible water tank in cabinet below. Dry goods storage cabinet above sink. Cabinet doors (3) are watertight ports. Molded open storage shelves above settee berths. Molded step box with lid. Stainless lifting bar bolted to keel for hoisting. Acrylic companionway board on white PVC runners. Specifications are subject to change without prior notice or obligation, J Boats reserves the right to periodically upgrade these specifications through additions, deletions and substitutions.